I love this quote. For me, this plea for compassion hits home more than any other quote on the subject. It’s often attributed to Plato, but it comes from Ian Maclaren, 19th-century Scottish author and theologian. Usually, I’m skeptical of absolute statements. Everyone? 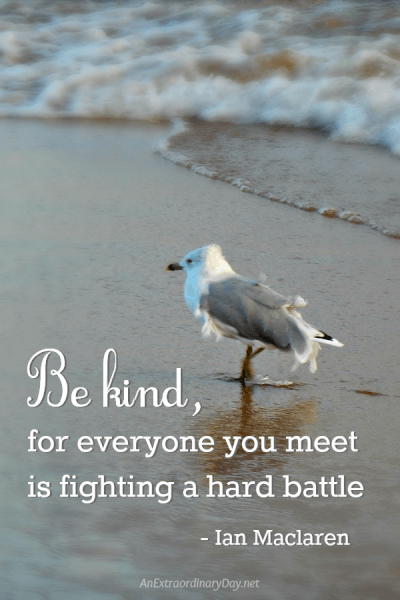 Is everyone you meet actually fighting a hard battle? Am I fighting a hard battle? Am I struggling to deal with adversity in my life? I’m happily married; it’s not an exaggeration to say that we both love each other as much as the day we were married, decades ago. We don’t struggle financially, but I keep an eye on income and expenses. I work out three or four times a week, but I’m limited by the inevitable infirmities of aging, for which I take several medications. l struggle with procrastination. I’m overweight. I’ve had several close brushes with death, but I survived them all to tell about it. My father died in a car accident when I was 22, leaving my mother to raise the five kids still at home by herself. I know for sure that every day was a hard battle for her. She died of complications from diabetes. I did an interesting exercise. I tried to consider every other person I know. My conclusion: yes, without exception, they are all dealing with ongoing adversities large and small, and probably most of their challenges are hidden from me. And I’m sure there are countless ways that your life isn’t easy. Challenges, frustrations, problems, disappointments, worries, crises, illnesses, loneliness, losses, and failures. Making a fulfilling life is far from easy. No, man. It’s hard. So, the next time you encounter strangers in your life, don’t see them as unknowable background props for your own life drama. Appreciate that each of them struggles with heavy burdens and hard battles. Instead of being distant and uncaring, we need to be compassionate and empathetic. Instead of being judgmental and critical, we need to be patient, tolerant and understanding. We can never know all the details of the life journeys of the people we meet. But we can be sure of one thing: their plates are full, and their lives are hard. No one is exempt. Every parent knows how hard it is to raise a child. It’s worth appreciating that it’s not easy to be a child, to struggle with learning how to live in the world, to make mistakes, to be powerless, naive, and not knowing how to do things. All teens struggle with low self-esteem. All of them want to be liked, but they have no idea how to accomplish this. And they’re ignorant of most of the aspects of life that really matter. Ultimately, they have to face the frightening prospect of being an independent adult someday, and most of them worry that they won’t be up to the challenge. Remember this the next time your child disappoints you or makes you angry. Instead of indulging in your own emotional reaction, instead of lashing out, before you say or do anything, make an effort to be understanding, to exercise empathy and compassion. Because no matter how wonderful a life you’ve created for your child, every day he or she is struggling with the awful battles of growing up. Developing critical thinking skills makes it easier for teens to fight their battles. How young people can acquire these skills is described in my new book: How Your Teen Can Grow a Smarter Brain.